The year-end appeal tax benefit is a huge pull for donors. But fundraising writing is not the only thing on reader's plate. As the calendar winds down, your blood pressure may go up. So much writing to do and so few days and minutes in which to do it, no matter if you're writing content or copy. The overwhelm is not limited to ministries or freelancers - but if you’re like most nonprofits, you’ll receive 30-50% of your organization’s gifts during the last quarter of the calendar year, when your supporters race to give individual gifts before the tax year ends on December 31. 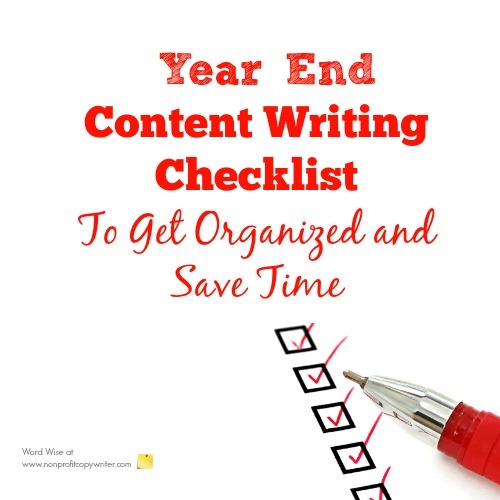 An intentional year-end plan will help you maximize your writing time at year end. Use this checklist to make sure you’re on track. Mail an engaging print appeal. Consider sending a second “reminder” appeal or even a series. Use the copy to show how your organization has helped change lives this year. Cite statistics that demonstrate how you make a difference for people in your very special niche and why your cause is a good investment. Most of all, emphasize the year-end tax benefit for charitable gifts mailed on or before December 31. Drop a reminder postcard mid-December. In these tough economic times, the public likes to see cost-conscious efforts. A postcard is cheap. Print yours on brightly-colored stock so it stands out in stuffed holiday mailboxes. Schedule an email appeal series. Include links to your website “Donate” page to make it easy for partners to give. Keep messaging consistent with your print appeal, but increase urgency with each successive campaign, reminding donors of the December 31 deadline. Schedule a "last call" email to go out December 29-31. Send Christmas cards. Have special holiday greetings printed that convey your organization’s message. Set aside time for staff to hand sign cards to top tier partners, board members, and key volunteers. Hold a phone-a-thon. Make calls to the top 20-50% of your donor list, thanking them for their past support and encouraging them to give by year’s end to receive a tax benefit. Mobilize your staff and volunteers to help. Write a brief phone script for them to use, emphasizing your organization’s appreciation for their partnership and reminding them to look in their mailboxes or email inboxes for your year-end letters. Party with special partners. Hold a holiday celebration for major donors, board members, and close friends of the ministry. Cultivate social media. Invite your followers and fans to create Cause pages to benefit your organization. Use your Facebook page or Twitter to publish regular holiday updates and post appropriate links. Refer regularly to your website’s “Donate” page as December 31 nears. Thank your donors and partners. Profusely. As soon as you receive a gift. Plan for next year. Reflect on what worked during the last twelve months. Write a list of development goals for the coming year and set down your strategy on paper. And before December 31, get going and start implementing it! Call to action: have you told your reader what to do?